Do you think that safe you bought at a big box store is protecting your valuables? It’s not and even manufacturer of the safe will tell you it’s not. I recently watched a report out of Vancouver where a locksmith demonstrates just how easy it is to get into the new Sentry Safes. Sentry safes have never been hard to break into mind you, but their newer, less-secure models are being bypassed using just a magnet. Yep, a magnet. A serious engineering fail brought about by thinner materials and often plastic paneling that allows the magnetic field to bypass the locking mechanism. What’s more, there will be no sign of forced entry. Sentry “security” safes serve one function only. Fire protection for your documents. If a fire-rated safe is all you need, then you’ll be hard pressed to find a less expensive option anywhere. Just don’t kid yourself. If you want even one iota of protection, skip the sentry safe. Even Sentry has acknowledged that their models (yes plural) that can be gotten into using this technique are only meant for fire protection. They’ve gone so far as to add the ability to put in your safe’s serial number and find out if your safe is secure or not on their website. Wow! Shouldn’t a safe offer some level of protection? After all it is called a “Safe” not an “Unsafe”. Sentry is openly acknowledging many of the safe’s they’ve sold do not offer protection and are intended for fire only. I respect their honesty on this point. What about the gun safes you can get at Sam’s Club or Costco? Those are good right? Nope. They’re not. Watch this video taken of a safe at one of the big box stores. Step 1: Read our article the 5 Most Important Features You Should Look for In a Safe. Step 2: Visit ACME Locksmith’s Shop for Safes website. 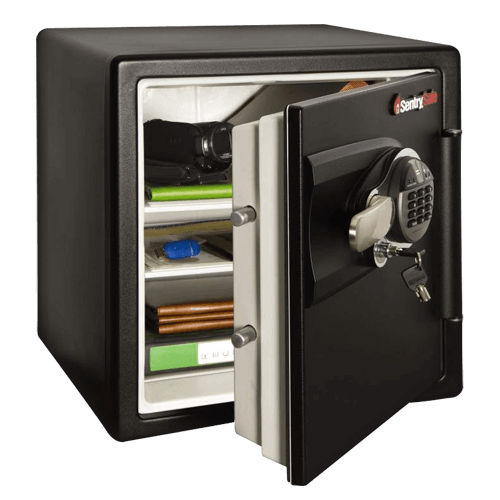 You won’t find a better safe for your price point than the safes we sell. Even so, don’t fool yourself, a $500 safe should not be used to protect $50,000 worth of valuables. It just doesn’t make sense. The less expensive the safe, the less secure it is. ← How Much Security is Too Much Security?